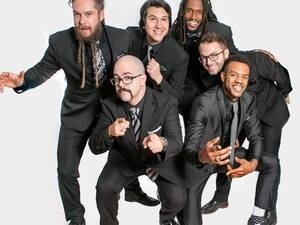 CES’ On the EDGE series at Frostburg State University will present the a cappella group Six Appeal on Thursday, April 18, at 7:30 p.m. in the Alice R. Manicur Assembly Hall of FSU’s Lane University Center. The performance features informal table seating, comfortable couch and armchair seating, and food and beverage options. Combining boundless musical prowess and sharp comedic timing, Six Appeal presents an energetic, family-friendly evening of music that spans decades of classic oldies, current chart toppers and catchy original tunes. Tickets are $15 and may be ordered by visiting ces.frostburg.edu, or by calling 1-866-849-9237 or 301-687-3137. The CES box office, located in the Lane University Center, is open Monday through Friday from 10 a.m. to 4 p.m.